VIEWTEK BLUETOOTH 4.1 RECEIVER:Built with Bluetooth 4.1/HFP/HSP/A2DP/AVRCP to smart your life that you can enjoy music and hands-free calling from your smartphone in premium-quality sound.Up to 33ft connection range guarantees low signal delay. 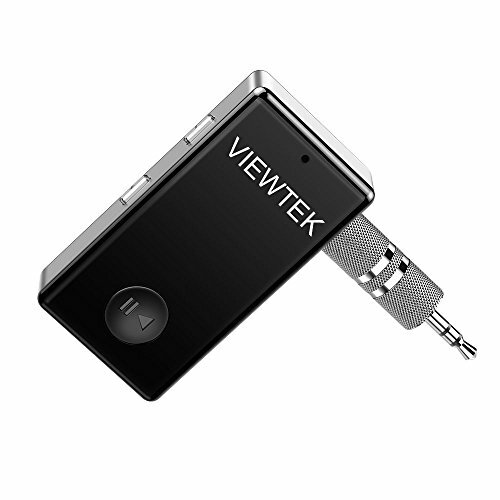 DOUBLE LINKS & WIDE COMPATIBILITY: VIEWTEK Portable Bluetooth Receiver can connect two Bluetooth devices at the same time.And it also could compatible with most smartphones and Bluetooth electronics, ideal for home or vehicle audio systems and wired headphones (connected with Viewtek via 3.5mm audio cable/adapter then pair your phone with VIEWTEK to achieve listening music or answering call). AUTOMATICALLY RECONNECT: Just turn on the Bluetooth of your cell phone first,and then turn on the Bluetooth receiver, the VIEWTEK Bluetooth Receiver can be automatically paired. Note:Bluetooth receiver doesn't turn on automatically,please long press the "Multifunction Button" about 3 seconds, when it turned on the blue light will flash,then connect it with your Bluetooth devices; 2.Please be sure the charging input voltage to it do not over 5V and do not use fast charger for the consideration of safety and the serve life of product. If you have any questions about this product by VIEWTEK, contact us by completing and submitting the form below. If you are looking for a specif part number, please include it with your message.